Cook the pasta in a large saucepan of boiling water following packet directions or until al dente. Drain. Return to pan. Meanwhile, place a medium saucepan of water over high heat. Bring to the boil. Reduce heat to medium-low. Use a large spoon to stir the water to make a whirlpool. Carefully crack 1 egg into the centre of the whirlpool and poach for 3-4 minutes for a soft egg or until cooked to your liking. Use a slotted spoon to transfer to a plate. Repeat with the remaining eggs. Add the oil, garlic, lemon rind, lemon juice and rocket to the pasta and toss until well combined. 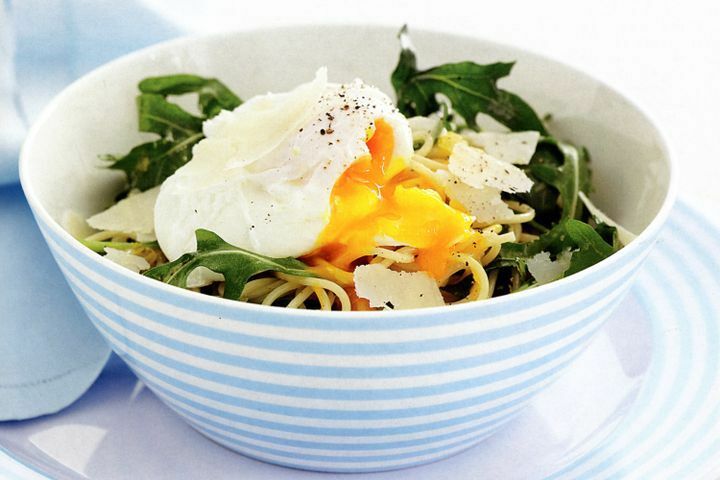 Divide pasta among serving bowls and top with poached eggs. Sprinkle over parmesan and season with salt and pepper to serve.